Sennheiser HD800S review | What Hi-Fi? If you have a spare £36,000 and want a reference pair of headphones, Sennheiser will happily sell you its outlandish Orpheus complete with partnering DAC/amp. It’s a superb-sounding combination, as you’d expect, but well beyond the means of all but a fortunate few. So, in the real world, where mortgage payments and credit card bills take a hefty toll on disposable income, the recently introduced HD800S headphones are the next best thing. They’re still pricey, at £1200, but that’s a far cry from premium car money. As the name implies, these are a development of the highly rated HD800 headphones we reviewed back in 2009. The ‘S’ version doesn’t replace the originals, sitting above them in price instead. Sennheiser is very proud of this new design judging by the magnitude of the bluster in the press release. The word ‘perfection’ gets mentioned, which always worries us. It overstates things somewhat - but that doesn’t mean these are any less than terrific. There are numerous changes over the original HD800. The most obvious difference is the shift from silver to black on the earpieces. But there’s more to the ‘S’ version than a mere colour change. Sennheiser is rather sketchy on the fine detail but its engineers have taken the lessons learned from the development of the IE 800 (high-end in-ears) and applied them to the structure around the driver to reduce resonances and even-out the frequency response. The new design is claimed to deliver a slightly wider frequency response of 4Hz to 51kHz (at a rather generous -10dB), where the original was rated at 6Hz to 51kHz. That appears to be a pretty minor difference on paper, but start listening and the upgrade in performance is notable. The HD800S’s driver remains the surprisingly large 56mm ring radiator of the original. It still fires the sound at a slight angle rather than directly into the ears to give more of a sense of space to the soundfield. The ‘S’ is offered with a choice of cables: there’s a 3m length terminated by a high-quality 6.3mm jack, and a balanced lead to allow use with Sennheiser’s standalone headphone amp, the £1500 HDVD 800. On paper at least, then, not much has changed. That the difference in price between the original and the ‘S’ is only around £100 seems to reinforce this impression. In most ways that’s no bad thing, and the HD800S remain a pleasure to use. Their headphones' weight of 330g is pretty light for this type of product, and the wonderful design of the headband and earpads means these are among the most comfortable full-size headphones we’ve tried. They’re for domestic use, rather than for going out and about, but they remain stable on our heads despite a relatively light touch when it comes to inward pressure. And they aren’t overtly showy in the way some rivals can be. Their combination of metal, micro fibre cloth for the ear pads and high quality plastics has resulted in a smart, modern design that feels as if it will last for years of heavy use. The open-back design means there’s plenty of sound leakage though - in both directions. In our busy office it’s possible to hear the noise going on around us; equally, everyone shares in the fun when we listen to Taylor Swift’s Shake It Off. The open design also means that our ears don’t heat up anywhere near as much as they do with closed-back rivals, and that’s a good thing. You’ll need a good quality set-up to get the most from these Sennheisers. We use our reference Naim NDS/555PS as source alongside our trusty MacBook Air loaded with Pure Music software. Amplification duties are shared between Chord’s excellent Hugo and Beyerdynamic’s hugely capable A1 headphone amp. It doesn’t take long to realise these headphones are something special. We start with Stevie Wonder’s emotion-packed All Is Fair In Love, and we’re struck by the way these headphones render Stevie’s distinctive voice: it’s beautifully textured, full of dynamic nuance and rendered with body and solidity. The relatively simple musical backdrop is organised with care. Individual instrumental strands are easy to follow, the HD800S’s innate resolution keeping things nicely separate but never going so far as to lose cohesion. We move onto Kendrick Lamar’s King Kunta and the Sennheisers sound right at home. That deep, pounding bassline provides a firm foundation for the rest of the music; it’s layered, rich yet as articulate as you like. Kendrick’s distinctive delivery is reproduced with all the grit it deserves, while the track’s juggernaut of a rhythm powers through, irresistibly. There’s a small hint of the HD800S’s playing a touch safe – something we noticed to a greater extent on the originals – but it never goes too far. The energy and sparkle of the music isn’t diluted, instead, this slightly rounded approach helps to give these headphones a good dose of refinement, which prevents even coarse recordings from annoying us too much. Next up is Rachmaninoff’s Piano Concerto No.3. Here these headphones show off their insight and delicacy. The music flows with grace and dynamics – both large and small-scale shifts are delivered with skill. We think Sennheiser has got the tonality of these just right, leaving instruments sounding full-bodied and convincing. Once again, the headphones' composure and resolving powers come to the fore as the music’s complexity increases. It’s all kept under control without sounding sterile. There’s a lovely sense of space to the presentation, something we don’t always associate with headphones. 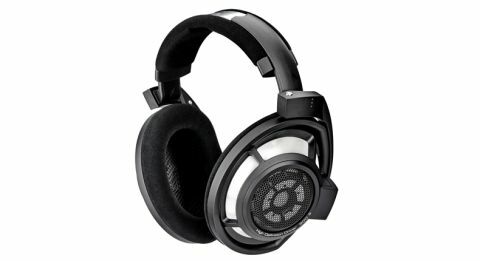 Although many people will have doubts about spending so much money on a pair of headphones, if sound quality is your main priority, then you should consider that you’d need to spend around 10 times as much on speakers to get anywhere near the Sennheisers’ insight and resolution. That’s assuming your listening room doesn’t have any issues of its own. Provided you have a good enough source and amplification these Sennheisers are an excellent buy.